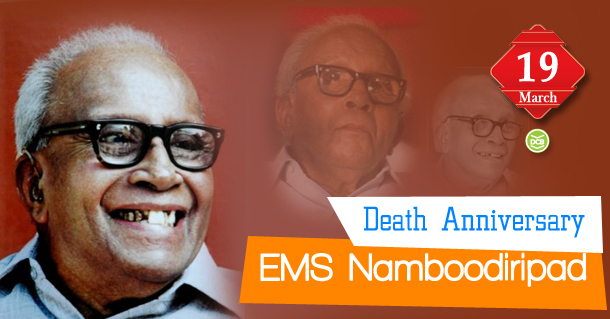 Elamkulam Manakal Sankaran Namboodiripad popularly known as E.M.S Namboodiripad was born on June 13, 1909. He was one of the foremost leaders of the Communist movement in India and one of the founding leaders of the Communist Party of India (Marxist). Born in a Brahmin family, he was trained in Sanskrit and scriptures but later he became interested in the civil disobedience movement and stood up against caste discrimination. Though started as one of the founders of the Congress Socialist Party in Kerala, he became acquainted with Marxism. He was one of the five members who formed the founding group of the Communist Party in Kerala in 1936. After holding prime posts in the party, E.M.S. Namboodiripad became Chief Minister of the first elected Communist ministry in India in 1957. His tenure saw the path-breaking land reforms, helped attract new private industrial investment to the state. Even after retiring from politics, he wrote prolifically on in. in his autobiography, E.M.S Aathmakatha, he describes the pre-independence era giving the reader a historical insight. He died on March 19, 1998, at the age of 89.